Miracle Fruit tablets are an excellent gift for yourself and your loved ones to treat the taste buds to an unforgettable experience. A must-have for diabetics, cancer patients, dieters, cooks, and those who love to experiment with food. 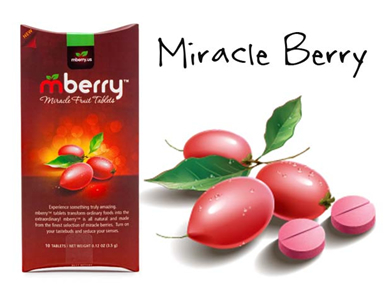 Miracle Fruit tablets are natural pills made from freeze-dried Miracle Fruit berries. The tablets have the same effect as the fresh berries. Tablets are double factory sealed and stored in a protective paper box. Copyright © floraexotica.ca. Last Updated 12-Oct-2008.